I often use Amazon EC2 to store and retrieve data when I need either additional storage or higher computing capacity. In this tutorial I’ll share how to connect to a MySQL database so that one can retrieve the data and do the analysis. I tend to use either TOAD for MySQL or MySQL Workbench to run and test queries against a MySQL database. I generally use MySQL Workbench when I’m sitting on a Linux-based operating system and TOAD when I’m on Windows. It’s not terribly difficult to connect to EC2 but it is also not as simple as typing localhost as it requires a few additional steps. If you’re reading this article then I’ll assume that you already know about Amazon EC2 and are familiar with the basics. Make sure you have all the security groups (i.e. IP Addresses) set up so that a database connection (for MySQL usually through port 3306) can be made from wherever you are located. All that is needed is the Public DNS that is available once you start your Amazon instance and the key pair file (.pem) used for the Amazon instance (the one Amazon tells you not to lose). The Public DNS can just be copied and pasted from the specific AWS instance you want to connect. The key pair .pem file should already be saved to your local hard drive. I generally use an Ubuntu operating system on an Amazon instance so some of the connection information is specific to that instance type (e.g. username of ubuntu). One additional tip is to turn off any locally running MySQL database on your desktop. MySQL Workbench is probably the easiest as everything can be done right from within MySQL WorkBench. The Public DNS from the instance can be added to the SSH Hostname line. This particular Amazon instance uses the username ubuntu. The SSH Key File is the file that is generated from Amazon. Next is the MySQL Hostname. 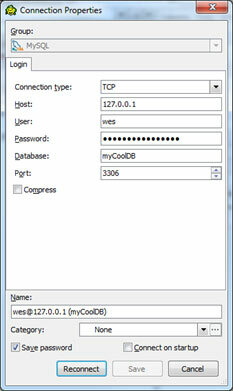 The database host is relative to the SSH connection. Once you have connected to the remote location it is now relative to the remote location and MySQL Hostname will be on localhost (though you can create more complex connections). Then you can use the database username and password you created (or were provided from the database administrator). Using MySQL Workbench is probably the easiest way to connect as the connection process is all self-contain. However, this will only work for MySQL Workbench and if you want to use other software (e.g. R) to connect to the database then this approach alone will not work. TOAD for MySQL requires an additional step as is it does not have a built-in SSH tunneling option. So the tunneling process requires separate software. 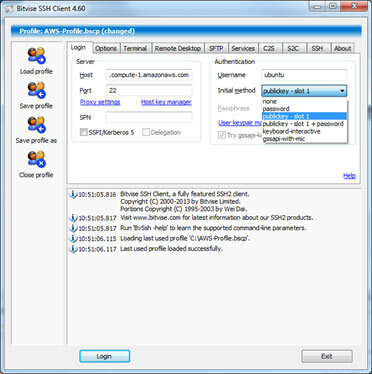 There are several ways to do this but two freely available options are either PuTTY or Bitvise SSH Client (Bitvise is free for individual use but otherwise there is a fee). PuTTY is useful and completely free however it requires that the .pem file be converted to a PuTTY specific .ppk file using the puttygen.exe application. First, take the Public DNS and add it to the PuTTY session. Though not required I would suggest going to the Connection category on the left and changing the keepalives to something like 120 and then check the Enable TCP keepalives. Otherwise, after a few minutes your connection will drop with inactivity. Second, you need to select the SSH authentication (located within the Connection category). This will be from the .ppk file created from the puttygen.exe file. Select the .ppk file and add it to the Private key file for authentication. Third, you need to enable SSH port forwarding. So that way you can connect to your local desktop but have all that forwarded on to Amazon. This way when connecting to your localhost at port 3306 you will actually be connecting to your Amazon Public DNS location. Like PuTTY you will enter your Public DNS and username. Then click on the User keypair manager. From the keypair manager import the .pem file into Bitvise. Take note of the slot column as that will be used to select the key pair you want to use. Once imported use the Initial method located directly below the username and select the keypair slot (e.g. “public-key slot 1”). Then to do the SSH port forwarding you will use the C2S tab across the top. Simply set the Listening interface and port to 127.0.0.1:3306 and the destination port to 127.0.0.1:3306. Once completed you can save the profile and then login. Finally, once you have opened an SSH connection using PuTTY or Bitvise you can then open up TOAD and create a new database connection. Because everything on 127.0.0.1 is being forwarded you will want to connect using 127.0.0.1 as your Host. Then enter your database username and password. A while back I wrote up an article on how to connect to a database using R (http://statistical-research.com/connecting-to-a-sql-server-and-mysql-database-using-ms-windows/). 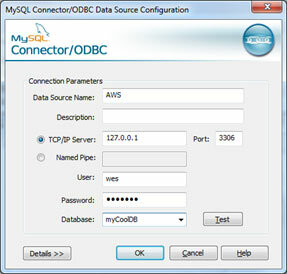 To connect to an Amazon EC2 MySQL database from R the same process is used. PuTTY or Bitvise will need to be running and since it has enabled SSH port forwarding, anything on 127.0.0.1 using port 3306 will be forwarded on to the Amazon Public DNS. So all that is needed is to create an ODBC connection pointing to 127.0.0.1 port 3306 and that connection will be forwarded on to Amazon. So if you ever change the Public DNS by stopping the instance you don’t need to change anything in the ODBC configuration. Only the PuTTY or Bitvise host will need to be updated.